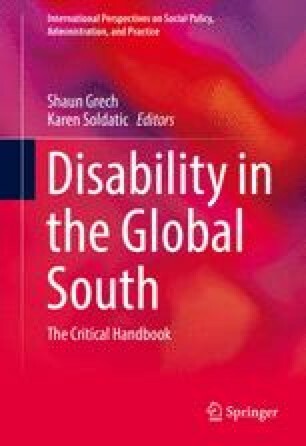 This chapter uses key features of intersectionality to review the relationship between disability, poverty and social protection and how this translates into realities lived by people with disabilities. The essential thesis is that being disabled, poor or requiring social protection—in one form or another—are all ways of creating identities in their own right. When brought together in one’s life, these identities intersect and create a series of outcomes that are more than the sum of the individual components. The chapter begins by setting out important features of social protection as a strategy for managing risk and promoting development, followed by an analysis of the interaction of such a strategy with poverty and disability. We present a number of examples to illustrate our arguments. AWID. (2004). Intersectionality: A tool for gender and economic justice. Retrieved March 13, 2014, from http://lgbtq.unc.edu/sites/lgbtq.unc.edu/files/documents/intersectionality_en.pdf. Devereux, S. (2013). Africa Trajectories of social protection in Africa. Development South Africa, (March), 37–41. Retrieved March 13, 2014, from http://dx.doi.org/10.1080/0376835X.2013.755871. Groce, N., Kembhavi, G., Wirz, S., Lang, R., Trani, J.-F., & Kett, M. (2011a). Poverty and disability: A critical review of the literature in low and middle-cinome countries (No. No. 16) (pp. 1–31). London. Retrieved June 8, 2014, from http://www.ucl.ac.uk/lc-ccr/centrepublications/workingpapers. Malan, M. (2013, 8 November). If they are raped, then so what? Mail and Guardian. Retrieved January 9, 2014, from http://mg.co.za/article/2013-11-08-if-they-are-raped-then-so-what. Marriott, A., & Gooding, K. (2007). Social assistance and disability in developing countries. Retrieved June 8, 2014, from http://www.handicap-international.fr/bibliographie-handicap/4PolitiqueHandicap/thematique/social_protection/SOCIAL_ASSISTANCE_AND_DISABILITY_July_2007.pdf. Oxford Policy Management. (2013). Evaluation of the Uganda social assistance grants for empowerment (SAGE) programme Baseline report (pp. 1–170). Retrieved June 8, 2014, from http://www.opml.co.uk/sites/opml/files/SAGE_IE_baseline_report_final_20130815_0.pdf. Schneider, M., Claassens, M., Kimmie, Z., Morgan, R., Naicker, S., Roberts, A., et al. (1999). We also count! The extent of moderate and severe reported disability and the nature of the disability experience in South Africa. Pretoria. Retrieved June 8, 2014, from http://indicators.hst.org.za/indicators/Disability/CASE_we_also_count.pdf.